Although Spring is just around the corner, a few weeks ago we were reminded winter wasn’t over. That promoted Jeremiah and I to cook up a few new soup recipes. I call this recipe the soup version of Canyon Chicken. In a large stock pot, combine chicken, cheese soup, broth, milk, celery, carrots, ranch packet, and bacon. Bring to a boil over a medium-high heat. Then, reduce to a simmer for 20-25 minutes, until vegetable is soft. Stir in noodles and shredded cheese. Cook for 5-10 minutes, until noodles are soft. I would suggest using leftover rotisserie chicken since this recipe doesn’t have any seasonings except ranch. I added a little parsley. I used low sodium condensed soup, low sodium broth and skim milk. I didn’t have celery so I omitted it from the recipe. I used real bacon. I suggest maybe just sprinkling on top before serving so ensure the flavor isn’t overwhelmed. The first time I met the Fox family was at Mythbusters Live. I’ve lived in Kansas City for about 15 ½ years. I barely ever run into people I know out and about. But since I met Jeremiah, it seems like we run into people he knows everywhere – Sam’s Club, the grocery store, dinner, and yes, even at shows. I think we also ran into an old coworker of his at Mythbusters Live. Travis is the brother of Kelly (mentioned in a previous post). Jeremiah has been friends with the Fox brother since they were little kids. It’s actually really cool because everyone seems to get together around the holidays to celebrate Layla’s (our own niece) birthday. Travis and Molly’s son Lex is pretty close in age to our nephew Aiden. It’s nice to see a second generation of kids playing together. 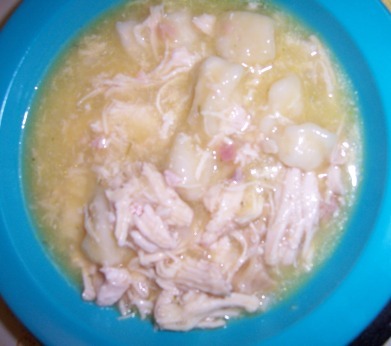 I’ve made chicken and dumplings before but this is my favorite recipe. It’s easy-peasy since you can cook it in the slow cooker. 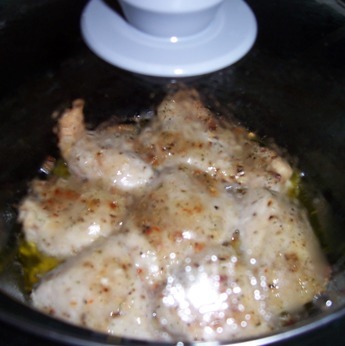 Put chicken in Crockpot with butter. Add soups, broth, onion, and spices. Cover and cook on low for 8-9 hours or high for 4-5 hours. After it’s cooked, shred chicken and add back to soup. Cut biscuits into 9 pieces. Stir into soup. Cover and cook on high for 1 more hour. I used 2 T. of Lipton’s dry onion soup mix. For a house warming gift, my boyfriend Jeremiah’s sister bought us a box of food from Hello Fresh. She was telling us about it a few months back because her mother-in-law had bought them some as a Christmas gift. If you aren’t familiar with it, they are one of those companies where they ship you all the ingredients to make a couple of recipes. The focus is on fresh ingredients. With Hello Fresh, you can select from 2 or 4 servings. They have two boxes to chose from – regular or vegetarian. Each comes with three recipes and all the ingredients you need to prepare those recipes (except oil, salt, and pepper). Each of the three recipes comes in its own individual box. At the bottom of the large box is all the fresh meat. All the recipes have similar ingredients. That means sense from a cost prospective. They also work it so you can reuse ingredients like chicken stock concentrate to cook peas and make gravy. They are pretty simple recipes and often increase less common ingredients like ginger, golden raisins, and parsnips. All the recipes called frying the meat. 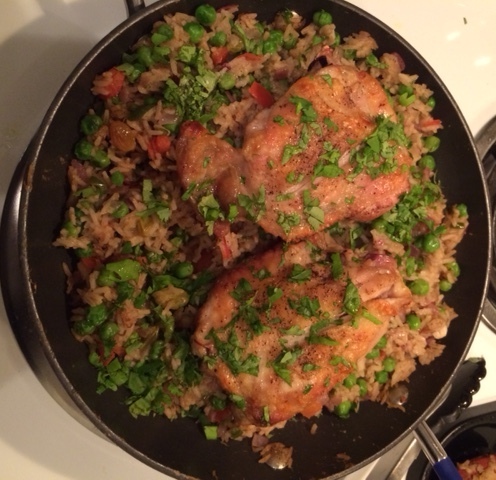 Since this isn’t how we normally cook our meat, we modified this recipe by baking the chicken. This particular recipe had fresh peas in it. I hate peas. Jeremiah asked if I wanted to not include them. They looked very fresh so I said we could include them. I decided if I hated them, I could always pick them out. That’s normally what I do with fried rice. To my surprise, I did not hate them in this recipe and ate all of them. I think the sweetness of the golden raisins helped. I’m sharing this recipe because it was the most complex and flavorful of the recipes we prepared. We kept the recipe because Jeremiah wants to make it again. Although this recipe was supposed to be just two servings, we ended up with a lot of extra rice. We ended up added preparing a little more roasted chicken breast and getting two more servings out of it. The leftovers were pretty good too. If you would like to check them out for yourself, I did see a Groupon for them last week. I’m not sure if it is still available but I think you were able to get a two serving box of three recipes for $40 – or about $6.50 per serving. Season the chicken with salt and pepper. Coat a pan with oil and cook chicken. Meanwhile, prep remaining ingredients. Dice the onion and tomato. Peel and grate the ginger. Mince the garlic. Cut jalapeno (remove seeds for less spice). Chop cilantro. Slice lime into wedges. Remove chicken from pan but leave the leave the oil in the pan. 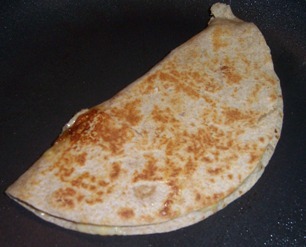 Add onion and jalapeno to pan. Cook for 4-5 minutes. Then, add garlic, ginger, garam masala, and cumin. Cook for an additional 1 to 2 minutes. Add tomato, rice, raisins, chicken stock, and 1 ¾ c. water to the pan. Season the pan with dash of salt and pepper. Bring to a simmer, cover, and cook for 12-14 minutes. Stir in peas. Cook uncovered for 3-5 additional minutes. Squeeze with a few lime wedges and sprinkle with cilantro. Serve with remaining lime wedges. Since I am going to be out of town next week, my boyfriend and I started the Harvesters SNAP Challenge on Monday. I have to say, I hope the first day was the hardest. 6:10 AM – I’m up early on my day off. I’m making Jeremiah’s coffee, breakfast, and packing lunch. This gives him a few extra minutes to get ready. I run his K-cup through the Keurig twice – once at 6 oz. and once at 10 oz. This gives him two full cups, all be it watered down, coffee. 6:50 AM – Breakfast is over. I’m disappointed that the ingredients to make 12-16 inch pancakes has resulted in 11 – three inch pancakes. We ate six of them. I’m wondering if this will keep us full until lunch. We normally eat an English muffin for breakfast with 8 grams of fiber. I usually combine mine with a bowl of cereal or an egg. 7:47 AM – As I’m leaving the post office, all I can think about is food. I’m thinking about that little girl in the documentary “A Plate at the Table” who said she couldn’t concentrate in class because all she could think of when she looked at her teacher’s head was a giant hamburger. I’m nervous about my day off being in an apartment full of food. I normally cook a lot of recipes on my day off. Will being surrounded by food all day entice me? 8:30 AM – Doing laundry. This should help keep me busy. 8:52 AM – I walked into the club house at my apartment complex to put money on my laundry card. 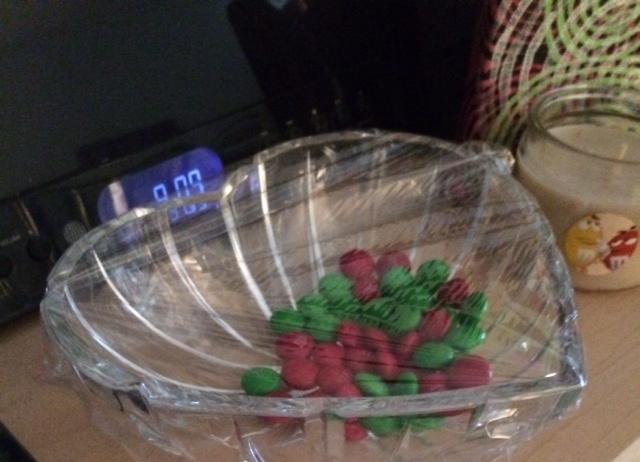 I am immediately tempted by a bowl of candy. I know I can’t take any because it isn’t in my budget. Not everyone on SNAP has a bowl of free candy accessible to them. 9:20 AM – I found a coupon for a free Sobe flavored water at HyVee. I’m so excited because Jeremiah loves these and they are off limit this week. Even buying them at Sam’s Club for about $.90 each we still can’t afford them in our budget. I told Jeremiah I needed a box of saltine crackers ($1.34 for 154 crackers) to get me through hunger pains. He didn’t pick his guilty pleasure item yet. 9:38 AM – This may be the cleanest my kitchen has ever been. All food and cookbooks have been put away. (This includes the three boxes of Thin Mint cookies is just got from a Girl Scout last week). Out of site, out of mind. 10:10 AM – Those noises my stomach has been making all morning are starting to feel like real hunger. I’m wondering if I can get four pancakes per serving out the mix for the next four days. 10:15 AM – I just took out recycling. Suddenly, those empty food containers are very noticeable. As soon as I come back in, I notice this week’s ads starring at me. 10:38 AM – Downing a glass of water. Will this help fill me up? 10:40 AM – I’m finding myself contemplating pulling out my yoga mat. It will be good for me. Perhaps I can meditate and “drop the story line”. Or maybe I should pray to God. Perhaps he can help me with these hungry feelings. But wait, what if he wants me to feel hungry? Maybe I need to feel this to better explain food insecurity to others. Jeremiah and I are like so many of the people we serve at Harvesters – hard working. According to the last hunger study, 49% of people served by Harvesters have at least one person in their household working. Additionally nearly 50% of the people who receive food are children, seniors, or disabled. 10:55 AM – I’m taking myself back to my days as a volunteer with an addictions group at the Jackson County Jail. We all have addictions and mine is food. I remember an Addiction Therapist Valencia saying when you have a craving it takes only about 45 seconds to figure out how you are going to feed that craving. But if you can distract your mind in that time by doing something, you can get your mind off it. I find myself now watching the dryer count down from five minutes singing the words to “Pump up the Jam” while marching in place. Seriously, I might be losing my mind! 11 AM – I’m debating about turning on the TV. I don’t have DVR which means I’ll either have to watch TV or put in a DVD. Rachel Ray is out today. I can’t watch a food show when I’m hungry and can’t eat. I decided to watch How I Met Your Mother. Do you know how many commercials there are during this show for Olive Garden, Chili’s and Red Robin? I’ve never been so excited to see a commercial for Dance Moms or Little Women: LA in all my life. I decided to mute the commercial breaks. 11:23 AM – I find myself laughing. It takes my mind off food for a few minutes. 11:30 AM – It’s Jeremiah’s lunch time. Normally, he would be eating out with his coworker Dan. They eat out every Monday and Friday. I’ve thought about texting him a million times this morning. I don’t want to bring up how much I’ve been thinking about food though if he isn’t. 11:37 AM – Laundry is done. Debating about going to the gym since I’m worried about working off too many calories. 11:42 AM – Drink my third glass of water. It’s free and will hopefully fill me up. 11:55 AM – I break down and eat five crackers and drink a fourth glass of water. Noon – While driving to the gym, I notice every fast food restaurant on my block. I have to keep focused looking straight ahead so I don’t think about it. My gym shares a parking lot with Margarita’s which isn’t helping. It’s sunny but cold outside so I try to focus on this instead. Maybe I’ll drive home through a residential neighborhood. 12:20 PM – I stop feeling sorry for myself by reading the closed captioning on the news. It’s so depressing watching stories about how people in Tennessee are without power from an ice storm and terrorist are plotting attacks on malls. 12:50 PM – Ran to HyVee to get another can of chickpeas. Jeremiah was right, the hummus recipe wasn’t enough for 10 servings. I pretend I have on the goggles on that Ted wears on How I Met Your Mother so we don’t see the score of the Super Bowl game before they watch it on DVR. I’m laser focused on the aisle with the canned veggies. 1:15 PM – Lunch is ready. I’m now regretting my decision to buy no salt added garbanzo beans or to not make more chips. I’m also wishing we had sampled the food we were cooking on Sunday night. 5:15 PM – The afternoon has gone smoother. I took a shower, ran to Target, balanced my checkbook, paid bills, and worked on my blog. Jeremiah has just called to let me know he is leaving work a little late. That’s good because I haven’t left for his place yet. 5:55 PM – Jeremiah and I start cooking dinner. Jeremiah focuses on grilling the chicken while I get the noodles boiling for Chicken Penne Pasta with Salsa con Queso. This wasn’t on our first menu. The recipe makes a lot, doesn’t contain very many ingredients, and fills us up. 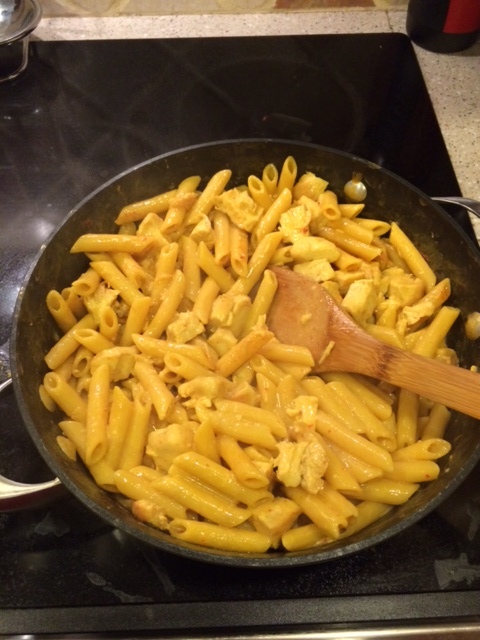 Thanks to whole wheat pasta being on sale for $.88, we can afford to make this recipe. Our cost is $6.19 but it makes six servings. That’s $1.03 per serving, very friendly on our $4.50 per day budget. I also made Jiffy corn bread for our dinner on Tuesday and Thursday. We had enough we decided to have a slice for dinner Monday through Thursday. 7:34 PM – After dishes, we finished off the night with a cookie (and a cup of coffee for Jeremiah). I asked Jeremiah how his day went. He said the pancakes wore off around 10:30 AM. He agreed that the hummus needed some seasoning. He was also a little surprised at how little tuna was in his sandwich. He was wishing we had budgeted more for tuna. I promised him that I would double check our budget to see if he could have some of the leftover servings from dinner for lunch.